Genghis Khan led the Mongol army which came to control one of the largest empire in history. However, what made the Mongols unique was their tolerance and spread of different forms of religion, trade, communication and civilization. Although the Mongols are traditionally known for their barbarism and brutal conquests, Genghis Khan abolished torture and allowed universal religious freedom. Through this open and vastly connected empire, the modern world was shaped. Genghis Khan came from a small tribe in the middle of nowhere where he was captured and used as a slave for a while and managed to escape through the help of some friendly citizens. He went back to his family and killed his older stepbrother and this disgusted his mother. He had a “blood” brother who would end up being his biggest rival to claim title of Great Khan, or leader of the Mongols. He was ruthless to anybody who betrayed him and to the aristocracy but was unprecedented in his tolerance of different religions and customs. This made integrating new people that he conquered much easier. Genghis created the largest trade route of the time and split the spoils of his conquering amongst all his people instead of hoarding it all like the vast majority of other rulers. Amazing what this one man was able to accomplish in a lifetime. 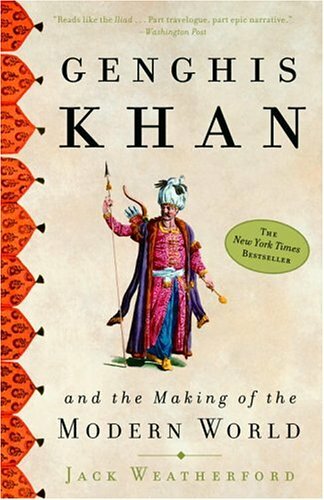 It was fascinating to learn the amount of positive influences Genghis Khan had on civilizations from Europe to the Pacific even though he is traditionally portrayed as a barbarian in Western cultures. The largest empire in the history of the world was ruled by Mongols, and by a woman (a descendant of Genghis’) on top of that. This entry was posted in Books and tagged Biography, Genghis Khan, History, Jack Weatherford on January 31, 2015 by Blas.